Read for This Week’s Study: Genesis 1, Gen. 8:22, Ps. 90:10, Job 1:13-19, Acts 9:1-22, Phil. 1:6, Rom. 8:1. Some of the most beautiful poetry ever penned came from King Solomon: “To everything there is a season, a time for every purpose under heaven: a time to be born, and a time to die; a time to plant, and a time to pluck up what is planted; a time to kill, and a time to heal; a time to break down, and a time to build up; a time to weep, and a time to laugh; a time to mourn, and a time to dance; a time to cast away stones, and a time to gather stones; a time to embrace, and a time to refrain from embracing; a time to gain, and a time to lose; a time to keep, and a time to throw away; a time to tear, and a time to sew; a time to keep silence, and a time to speak; a time to love, and a time to hate; a time of war, and a time of peace” (Eccles. 3:1-8, NKJV). Those words capture so much of human existence—the seasons, the rhythms of our lives. Yes, our lives go through stages, through changes, and they do so from the moment we are born. Sometimes the changes are good, sometimes not; sometimes we have control over them; sometimes not. This week let’s look at the seasons and rhythms of our lives, especially as they impact us and our families, too. Study this week’s lesson to prepare for Sabbath, April 6. The Bible begins at the beginning, which is no doubt why it begins with the words (actually one word in the Hebrew), “In the beginning … ” (Gen. 1:1). The particular focus of the chapter, of course, is the transformation of the earth from a state of being “without form, and void” (Gen. 1:2) to the world that God Himself, on the sixth day, declared “very good” (Gen. 1:31). In short, the beginning here is the beginning of our world. Read Genesis 1. Though so much is going on, ask yourself the question: Is there any hint of randomness or chance, or is everything done in a very orderly manner with everything in its proper time and place? What does your answer say about the character of God? Ellen G. White wrote that “order is Heaven’s first law” (Signs of the Times, June 8, 1908); apparently it is on earth, as well. Though sin has disrupted the natural world, to some degree, order, rhythm, and regularity still exist. Read Genesis 8:22. How is order seen here, as well? Even after the Fall, the seasons come and go in an orderly fashion—generally. Hence, along with the lights in the sky, i.e., the sun and moon, which are to “divide the day from the night … for signs and seasons, and for days and years” (Gen. 1:14, NKJV), there are the seasons as well, all part of the natural rhythm of the world that God has created. And indeed, though we get only glimpses now, a verse such as Isaiah 66:23 implies that in the new heavens and new earth the sense of rhythm will, indeed, exist then too. Think about how the Sabbath, in a powerfully regular way, impacts your life, especially your family life, whatever it is. What are the distinct advantages, not just of the Sabbath, but in the fact that it does come with such regularity? Scientists talk about something called circadian rhythms, the idea that there are biological rhythms (sometimes called “body clocks”) that regulate function in our bodies. In other words, a certain degree of regularity exists even within our bodies themselves. Hence, to some degree, rhythms exist all around and even in us. 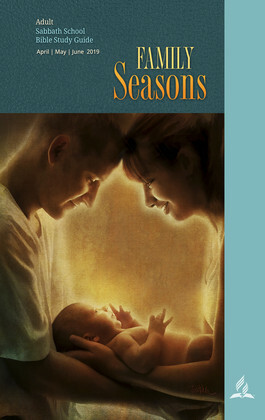 What are the predictable seasons of life mentioned in the following passages of Scripture, and how do they directly tie into family life? Between the two bookends of life, birth and death, we all go through a variety of seasons, different for each individual. Some children don’t live long after their birth; others grow into adults who live to a ripe old age. Children grow and develop at their own rate. Some walk or talk sooner than others. Some will be able to attend school and grow up to be professionals, while others will devote their time to other forms of work. Some will have families, and others may never marry or have children. There are billions of people on earth, and though we all have much in common (see Acts 17:26), each one of us is an individual, and thus, differences will exist in each one of our lives. In a sense, too, these differences are important because they make each one of us unique, which means each one of us has something to share that others don’t have. In short, our differences allow us to be a blessing to others. For instance, both young and old can benefit from what each offers the other: “The glory of young men is their strength, and the splendor of old men is their gray head” (Prov. 20:29, NKJV). Whatever stage we are in, and no matter our differences, we all have something to offer, not just to the Lord, but to each other, as well. Whatever your life circumstances happen to be right now, what can you do to be a blessing to someone else? Why not make a conscious effort to be that blessing, especially to someone in your family? Read Job 1:13-19, 2:7-9. What happened to Job? In what ways does his experience reflect what happens to everyone, in one way or another, or at one time or another? The Greek philosopher Heraclitus declared that “there is nothing permanent except change”. Just as it seems that everything is going fine, the unexpected happens. It may be the loss of a job or a limb, an illness that sends us to bed or to an early death, a house fire, a car accident, a fall while walking the family pet. Of course, not all changes have to be negative. Maybe a promotion at work leads to better economic conditions. Or perhaps you meet someone who will become your spouse, a change that many would welcome. Either way, we can be going along, even in a routine, a rhythm, when, instantly and unexpectedly, it’s all disrupted. Job was certainly not expecting the new season in his life. The Bible describes him as a man who was “blameless and upright, and one who feared God and shunned evil” (Job 1:1, NKJV). We also know that he was married, had seven sons and three daughters, and was very wealthy (Job 1:2, 3). By the time we reach the middle of the book, he has suffered at least six major losses: his property, his labor force, his children, his health, the support of his wife, and the encouragement of his friends. His world has been turned upside down and his family life devastated. Though what happened to Job was quite extreme, who among us hasn’t experienced the unexpected, in a very negative way, too? Life can be going along just fine when, suddenly and without warning, everything completely changes, and our lives—and our family’s lives—might never be the same again. This is nothing new. Abel probably didn’t expect to be murdered, and Joseph didn’t exactly expect to be sold into slavery in Egypt. In both stories, family members were the betrayers, and in both stories the families were greatly impacted by what happened to other members. Scripture is full of examples of people whose lives, and families, were greatly transformed by the unexpected. How has your faith helped you amid the trials that unexpectedly interrupted the rhythms of your life? The fact is that human beings are, often, creatures of habit. And we do, indeed, get set in our ways, and the older we get, the harder it is to change those ways. Indeed, we don’t change easily. How many wives have complained over the years, “I’ve tried to change my husband, but … ”? However, God is in the business of changing us, if not so much our personalities but, certainly, our characters. That’s so much of what the plan of salvation is about: God making us into new people in Him. What great change happened to Saul of Tarsus, and how did it happen? Acts 8:1, 3; 9:1-22; Gal. 1:15-17. The prayers of the penitent Pharisee were not in vain. The inmost thoughts and emotions of his heart were transformed by divine grace; and his nobler faculties were brought into harmony with the eternal purposes of God. Christ and His righteousness became to Saul more than the whole world”. – Ellen G. White, The Acts of the Apostles, pp. 119, 120. Even if our own conversion stories are nowhere near as dramatic as Saul’s, we should all have our story, an experience of how the Lord has worked in our lives to change us, to make us into the kind of person we know we should be. Yes, the process can be long, and at times it’s easy to wonder if we are ever going to change. At times like these, two Bible texts are so crucial to meditate on and to claim for oneself. Read Philippians 1:6 and Romans 8:1. What two great promises are found in those texts, and how do they fit together in the experience of a Christian? The Bible is a book of relationships. God created us to be in relationship with others. Indeed, very few of us live in complete isolation. For starters, none of us could even come into existence but for others. Even after birth, we need others to take care of us, at least until a certain age when, in principle at least, we could exist on our own. And even if we could, who would want to? Most of us need and crave the company and companionship of other human beings. Though pets, such as dogs, can be delightful companions, in the end the deepest and most meaningful and life-changing interactions come from other people. No wonder, then, that the family, and family relationships, are so crucial to our existence. Because most of us do interact, often all the time, with others, these interactions can and often do impact the changes and rhythms of our lives. It works two ways, though: others, in their interactions with us, impact our lives. We, meanwhile, in our interactions with others can impact their lives. And whether we realize it or not (and many times we don’t), those interactions, in either direction, can be either for good or for evil. How crucial then for us to be proactive, at all times, so that our inevitable influence on others is always for the good, especially those with whom we are closest, which is usually our own family members. Read the following texts. What do they tell us to do in our interactions with others? Rom. 15:7; Eph. 4:2, 32; 1 Thess. 3:12; James 5:16. In many ways, the principle is simple. If we act nicely, kindly, and compassionately toward others, we will be a positive influence upon them, even to the point where we could change their lives in a very positive way. Just as Jesus changes people’s lives in a very positive manner, what a privilege for us to do something similar for others, as well. Again, we must remember: our influence is going to be either for good or for bad, even in subtle ways. And nowhere is this influence, subtle or not, more pronounced than in our families. Look at the two following statements of Jesus: Luke 11:34 and Mark 4:24, 25. What are they saying about the importance of how we interact with others? Further Thought: Imagine the changes that occurred in the life of Christ’s disciples as they spent time with Him. They were mostly uneducated, simple people, accustomed to the teachings and traditions of their Jewish faith, but now they were being challenged by the Galilean Rabbi. They experienced jealousy (Matt. 20:20-24) and conflict (John 3:25); they seemed to lack faith (Mark 9:28, 29), and they even abandoned (Matt. 26:56) and betrayed Jesus (Matt. 26:69-74). At the same time, they were growing spiritually so that people recognized Peter had been with Jesus (Matt. 26:73), and even the members of the Sanhedrin marveled when they perceived that Peter and John were “uneducated and untrained men”. “They realized that they had been with Jesus” (Acts 4:13, NKJV). Think, too, about the incredibly positive impact we could have in our families if we lived in such a way that when other members of our family see us, they know that we have “been with Jesus”. What do these words from Ellen G. White have to say about influences in the home? “The home may be plain, but it can always be a place where cheerful words are spoken and kindly deeds are done, where courtesy and love are abiding guests”. – The Adventist Home, p. 18. Read Ecclesiastes 3:1-8. What are these verses saying, and how can you apply the principle there to your own life and experiences? In class, talk about some of the life-changing experiences that you have been through, and talk about the lessons you learned and, if applicable, the lessons you should have learned but didn’t. What did you learn from the lessons that you didn’t know? Also talk about how these life-changing experiences impacted your family. What lessons did you learn in these situations, too? What are the ways you live today that, were it not for Christ in your life, would be radically different than they are now? What should that tell you about the power of Christ to change us? 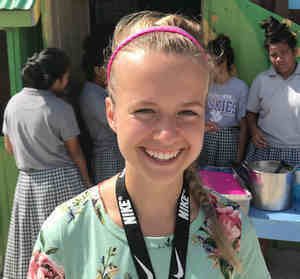 The year couldn’t have gone worse for Elisa Albertsen, a native of Palmer, Alaska, who quit a promising career as a hairdresser to volunteer at a mission school in the Marshall Islands. Just three months into the school year, she had to be airlifted back to the United States after dislocating a kneecap while playing soccer at Ebeye Seventh-day Adventist School. After four months in the United States, Elisa was still recovering and realized that she would have to break her promise to her students to return before the end of the school year. Then she and her long-time boyfriend broke up. Disappointed and discouraged, Elisa decided to take a 40-day fast from secular music, books, and movies, and to immerse herself in the Bible and the writings of Adventist Church cofounder Ellen G. White. It was then that she started a joy journal. “I wanted to count 1,000 gifts God gave me”, she said. The daily entries in the joy journal began with simple things. Elisa wrote that she was grateful for clean water and the sunlight shining through the window. As she continued to write, she remembered the words of the apostle Paul, “Rejoice always” (1 Thessalonians 5:16; NKJV). When she discovered ants swarming over the food in her dog’s bowl, she thought, “This is so frustrating. I hate ants!” Then she remembered the joy journal and, peering closely at the busy ants, marveled at their perseverance, teamwork, and ability to carry a load many times their size. In her joy journal, she wrote, “I thank God for ants. Through God, we can accomplish things that are much bigger than us”. Elisa also found joy in other negative circumstances. When someone criticized her, she wrote, “Thank You for that critical word because it puts me on track to improve and draw closer to You”. She thanked God for her dislocated kneecap, realizing He strengthened her mentally and physically through the injury. Elisa is now 21 and back at Ebeye as a second-grade teacher. She pulled out the joy journal after catching a flu going around the island. “When I lost my voice, I said, ‘Praise God because now I can hear my children better”, she said. Part of the second quarter 2018 Thirteenth Sabbath Offering helped the Ebeye Seventh-day Adventist School carry out repairs on crumbling classrooms. Thank you for your mission offering.